Welcome to the third year of the #AuthorToolboxBlogHop, which is a monthly event on the topic of resources and learning for authors. Feel free to hop around to the various blogs and see what you learn! The rules and sign-up form are below the list of hop participants. All authors at all stages of their careers are welcome to join. Non-writing publishing peeps (editors, book-marketing specialists, book-cover designers, picture-book illustrators, etc.) are welcome, too. 1. Theme: this is a monthly blog hop on the theme of resources/learning for authors: posts related to the craft of writing, editing, querying, marketing, publishing, blogging and social media tips for authors, reviews of author-related products, anything that an author would find helpful. Sharing of your experiences as it relates to these topics is encouraged but straight journaling with no takeaway for authors is not what this hop is about. Can you post genre-specific content? Absolutely. You have an idea for a post that doesn’t fit the parameters I’ve outlined, but you feel in your heart of hearts that authors would benefit from reading it? Go nuts. Interviews are also permitted as long as they provide valuable knowledge for authors (i.e. advice.) Straight book reviews are not permitted unless they are reviews of books about writing/publishing/etc. 2. The who: all authors at all stages of their careers are welcome to participate. Non-writing publishing peeps (editors, book-marketing specialists, book-cover designers, picture-book illustrators, etc.) are welcome, too. If your website is a joint collaboration with several authors, we’d be happy to have you as well. One blog per participant. 3. The when: mark your calendars! The blog hop is the third Wednesday of every month (with a reminder email sent a week prior,) and we will take November/December off (because we can.) For your convenience, there is a calendar below that highlights the 2019 hop dates. You have to post the first third Wednesday after which you sign up. If you skip more than one month in a row, you will be removed from the hop. Not to worry, though, because all you have to do to rejoin is shoot me an email, and I’ll re-add you as the next available participant number. What about time zones, you ask? Because those in the Eastern Hemisphere have a head start, I suggest everyone get their posts up a day or two early. Have your blogs posted BY the third Wednesday of every month, and that way you won’t miss out on comments from those in the Eastern Hemisphere. Strictly speaking, the Wednesdays of the hop are the commenting/hop days, but get your posts up before that whenever possible. Please note that because some participants have busy blogging schedules, you might have to scroll back through their posts to find their #AuthorToolboxBlogHop. 4. Commenting: on the day of the hop, please visit and comment on at least 8 other blogs in the hop. The more comments you give; the more you’ll receive in return. Either on the day of the hop or in the days following it, please visit all those who commented on your post and add a comment to their post. The only exception is if you feel morally or ethically unable to do so. The idea is if everyone is returning comments, you should get as many comments as you gave or close to. If I’m made aware that a participant is generally not following this rule, they will be removed from the hop. To make it easier for participants to return your comment, a useful tip is to leave your URL in the comment. Bonus tip: make sure your Gravatar is linked to your website. This makes it easier for WordPress bloggers to find you. 5. Inappropriate content: this is a safe space for learning and engagement. If I am made aware that the content of your website or social media is discriminatory or xenophobic, you will be removed from the hop. You will not be removed if your content promotes healthy discussion of topics such as diversity, privilege, or cultural appropriation. 6. Permitted self-promotion: non-lengthy self-promotion is permitted. 7. 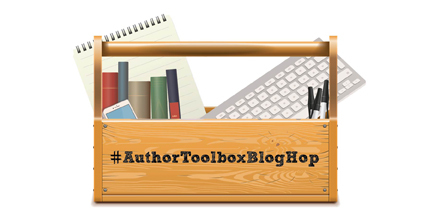 Include hop name in post title: please include #AuthorToolboxBlogHop or ‘Author Toolbox Blog Hop’ or ‘Author Toolbox’ or some variation in the title, so other participants know which post to click into. You don’t have to include the hashtag when posting to social media, but I recommend it; it’s how we find, like, and repost/retweet each other’s posts around social media. 8. Post must include hop link: the link to this main hop page must be included somewhere in your post. If you prefer cut-and-paste code, here you go. Including the official hop image is optional, but if you don’t have an image for your post, I recommend using it, because posts with images will generate more traffic to your blog from social media sites, and people are more likely to share your blog on social media if there’s an image. 9. No sign-ups for post content: the content of the blog hop posts, including any free templates, must be made available without requiring a newsletter sign-up for access. You can encourage sign-ups for other content, but people have to be able to read your toolbox posts. Once you add your details to the form below the calendar, they will auto-magically appear on the list of participants at the top of this page (expect a delay of up to an hour.) Your email will not be published and will only be used by me to send you a monthly reminder a week before each hop date. For technical reasons, you have to sign in to your gmail account to complete the Google Form. If you don’t have a gmail account, you’ll have to set a free one up before you can complete the form. When your name appears, it won’t automatically appear next to your number, and though your link will appear next to your name, your name itself won’t appear as linked until I go in and manually adjust your entry, which I try to do at least twice a month. Happy to have you:) Yea! Me too! Thanks for joining! This looks great! Thanks for putting it together. My pleasure. 🙂 Thanks for joining! Terrific idea — can’t wait to see what comes! Thanks! And thanks for joining! Another brilliant hop idea, Raimey. Thanks for helping build a great writing community. My pleasure:) Thanks for joining in, Erika! I’m very excited about this. Thanks for putting it together. Thanks for putting this together! I’m not sure if I can commit to it right now. Will I miss my chance to join if I wait? This is an ongoing event, and you can join whenever is best for you. 🙂 No rush. Yay!! These blog hops are the best!!! You are a saint for putting them together!! I added you back in about five minutes ago. 🙂 Woohoo!!! I’m not quite ready to guest post yet, but I bookmarked this site for later. Thanks for letting me know about this! Hi Raimey–I’ve signed up! You’re exactly what I love about writerly blogs. But, I won’t be able to start until August. You might suggest I simply sign up in late July… Well, I’m afraid I’ll forget! I hope this is OK. I would love to join, but I really don”t understand hashtags. I thought they were for things like twitter which I have no desire to join. I can start in July if you like. That sounds great, Beth. I’ll send you a message on your site. Sorry gang, but I’m going to need to skip this month. Too many pressing things right now. I’m excited to get started and add my blog to the mix this week! Hi Raimey, is it okay to password protect my post (I used “bloghop”)? I love this hop but want to separate these posts from what’s generally visible on my blog. Is that ok? Thanks for letting me know. For everyone, I look forward to reading your ideas. This is great! Thanks for hosting this. I look forward to participating.